Aaxeon Technologies is proud to introduce the FCU-280x series of 10/100/1000BaseT to 1000BaseSX/LX gigabit fiber media converters. ...the installation is quick and easy using a simple plug and play feature. Aaxeon’s gigabit fiber media converter series (FCU-2802SC , FCU-2802SC-S10 , and FCU-2805SFP) supports conversion between 10/100/1000BaseT and 1000BaseLX/SX networks. With three types of connectors (SC, SFP, and WDM), single-mode or multi-mode media can be provided by the FCU-280x series for efficient gigabit fiber network construction. The Ethernet signal allows the connectors to link up easily, efficiently, and inexpensively. The FCU-280x series can be used as a standalone unit when powered by its DC adapter or used as a slide-in module with Aaxeon’s 19 inch 16-slot media converter rack chassis. These media chassis can supply power to the FCU-280x and permit the fiber-optic network to be maintained at one location. Since the gigabit fiber media converter series fully complies with IEEE 802.3 10BaseT, 802.3u 100Base-TX, 802.3ab 1000BaseT, and 802.3z 1000BaseSX/LX, the installation is quick and easy using a simple plug and play feature. The FCU-280x series also supports flow control and back pressure in half-duplex to eliminate the chance of packets loss. 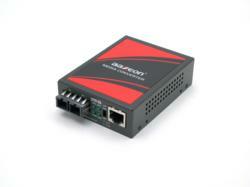 Aaxeon is a developer and supplier of Device Networking and Industrial Communication products. Aaxeon's main focus is to be a leading supplier of products and solutions into the rapidly growing markets of M2M (Machine-to-Machine) and Industrial Ethernet.